Mushkin presents the FrostByte II, a new line of aluminium memory heatsinks that will hit the market in February. They will be available in red and black. Mushkin Enhanced Mfg., an industry-leading designer and manufacturer of high-performance and mission-critical computer products, has unveiled the new refreshed FrostByte heatsink for Blackline and Redline memory modules. Cut from aircraft-grade aluminum, the FrostByte is the newest model of durability and functionality. The new FrostByte heatsink utilizes our new vortex thermal design to dissipate and control accumulated heat while maximizing PC performance. An ideal solution for computer enthusiasts and gamers, the heatsink's diamond cut design will definitely turn heads. 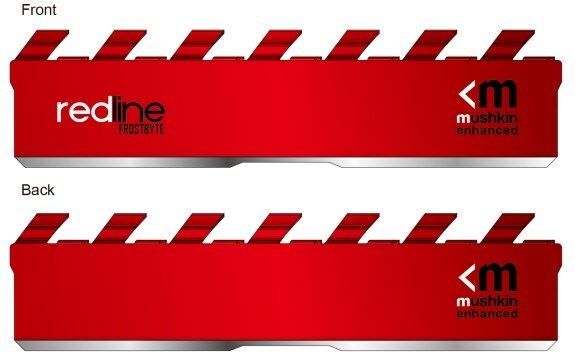 The FrostByte heatsink will begin rolling out in February 2014 on Redline and Blackline performance memory module offerings. "What is great about the new FrostByte heatsink is that it allows us to push the limits of our Redline and Blackline memory to new levels while effectively managing heat. Mushkin is constantly innovating to achieve stronger results," said Brian Flood, the Director of Product Development at Mushkin. "The new FrostByte heatsink is just the beginning of what's to come from Mushkin in our high-performance memory category."